Winifred “Winkie” Ward Keith died peacefully at the Henrietta Brewer House on Sept. 30; she was 76 years old. She was born in Harlem, Manhattan, New York City, on April 9, 1941, and was the only child of Margaret Bradshaw Alling and Hugh Allen Ward, known from the time she was very young as “Winkie” to distinguish her from her grandmother, Winifred Alling. She grew up in New York City, where her father worked for the Banker’s Trust Co., but she spent most summers at her family’s summer home at Westhampton Beach, Long Island. She attended the Chapin School in Manhattan from kindergarten through 10th grade and then transferred to Abbott Academy in Andover, then an all-girls school, since merged with Andover Academy. After graduation in 1959 she went to Bennett College in Millbrook, N.Y., graduating in 1961. She returned to New York City and got a job at Young & Rubicam, where her name was used for an advertisement: “Winkie Ward the Windex Girl.” Following that, she took a job at Olin Mathieson Chemical Corp. as a research librarian, where she worked until she married. During school summer vacations, she attended a summer camp in Maine in 1953 and got a very light case of polio. She also discovered travel. Her parents took her on a train trip to southern Canada, the Canadian Rockies, California, and Arizona. In 1960 she and three friends toured London, Paris, Rome, Sorrento, and Capri. In 1958 she got a job as a babysitter in Edgartown, her first visit to the Island, little realizing she was destined to live there later. Otherwise summers were spent at Westhampton with friends and several cousins, teaching water skiing on the side. In November 1963 she met her future husband Allan when invited by a college friend to play bridge. After a brief courtship, they were married in New York City on May 2, 1964, at Madison Avenue Presbyterian Church. The couple moved to Montclair, N.J., and their first child, Lucy, was born on March 20, 1965, on the first day of spring in a blizzard. In June of that year Winkie had a mild stroke, but recovered very well. A second child, Lesley, was born on August 5, 1968. Anticipating the second child, the couple moved to New Vernon, N.J., where they made their home for the next 27 years. In 1962 her husband’s younger brother died, leaving a 7-year old daughter, Coral, who was added to the family and formally adopted in 1982. While in New Vernon, Winkie was active in the local Presbyterian Church, helped run a Girl Scout troop, and was awarded a 1,000-hour service pin at Morristown Memorial Hospital. The family left New Vernon in 1994 and settled in Duxbury for five years before her husband retired, and they both moved to Chilmark full-time in 2000. 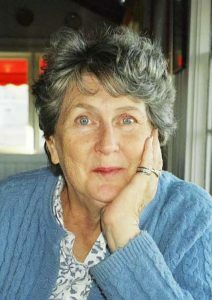 Wanting to remain engaged with other people, she got involved in the Women’s Symposium, was active in the Garden Club, was a docent at Polly Hill Arboretum, and volunteered at the Martha’s Vineyard Hospital blood bank. Beginning in 1967, she and her husband began a series of almost yearly trips abroad. She was one of the first 100 women to set foot on Antarctica. This was followed by visits to more than 30 countries in Australasia, India, Nepal — where she climbed to 14,000 feet on the slopes of Mount Everest — Southeast Asia, South America, Africa, Middle America, China, and the West Indies. Virtually all these trips were focused on wildlife, primarily birds, but also wild mammals and cultural sites. In many instances, the places visited were remote and lacking in many creature comforts, but Winkie thrived on the adventure, never complaining about indifferent food or spartan accommodations, quite in contrast to the civilized existence she grew up in on East 72nd Street in Manhattan. Perhaps the thing that typified Winkie most was her sunny disposition and outgoing, happy personality. Hers was a joyous soul. Despite a long series of medical interventions, including several surgeries in the last 10 years of her life, she was always upbeat, positive, and optimistic. She had a gift of making friends very easily, keeping college and school classmates and new friends close for years. She sent out about 75 birthday and anniversary cards and about 200 Christmas cards every year, with notes on each one. She was generous and openhearted, personification of the notion that a stranger is a friend she just hadn’t got to know yet. She is survived by her husband of 53 years, Allan R. Keith, daughters Lucy W. Keith-Diagne and Lucy’s husband Tomas Diagne, her daughter Lesley Tess P. Keith, her daughter Coral D. Rabey and Coral’s husband Steven M. Rabey, Coral and Steve’s son Max Rabey and daughter Skye Lily Rabey, and numerous first cousins. A graveside service was held at Abel’s Hill Cemetery on Oct. 10, followed by a memorial service at St. Andrew’s Episcopal Church, Edgartown, both officiated by the Rev. Cynthia Hubbard, and a reception followed the memorial service at the church. In lieu of flowers, those who desire may make a donation in Winkie’s name to African Aquatic Conservation Fund (africanaquaticconservation.org), or to Maine Children’s Cancer Program, c/o Maine Medical Center, Philanthropy Dept., 22 Bramhall St., Portland, ME 04102.